Pokémon GO Alolan Persian is a pure Dark type Pokémon which evolves from Alolan Meowth. Our tropical feline can only be obtained currently through the Friendship Gift system, hatching from the 7km egg which can be found inside. With a fairly measly max CP of 1615, our round-faced feline is highly unlikely to be a meta-changing addition. It has a sub-par attack stat, but has higher or equal stats to its Kantonian brethren, sporting 158 attack, 139 defense, and 130 stamina. Tyranitar still reigns the meta as the best Dark type attacker in the game. Unfortunately our new kitty comes bottom of the pile of evolved Dark types. Even Sneasel, an unevolved form, has a higher max CP at 1868. In this chart, we will look at its viability as a Dark type Pokemon and how it sizes up to the Generation 4 Top 10 Dark types. As mentioned above, Persian isn’t in the Top 10, in fact its #24 out of the 36 Dark types up to and including Generation 4 – it simply can’t compete with the other options in terms of raw DPS. It may see some limited use as an attacker against Psychic raids, which are all to common, but otherwise its more of a flavor Pokémon. Probably why its the most common offering of the four available in Alolan Eggs. What made this Pokémon special in the main games were abilities and moveset mechanics which do not exist in Pokémon GO. So if these are activated in the future, or possibly in LGPE, we may see this more. In Generation 7, Persian has the ability Fur Coat which reduces damage taken from physical attacks, since most fighting typed moves are physical this can be a good option for longevity in battle. The move Parting Shot is a great move in the main games, the user lowers the target’s Attack and Sp. Atk stats. Then it switches with a party Pokémon. 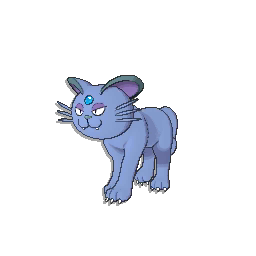 This move is usually why we see the Alolan Persian, although it can only learn it by breeding, only a small number of Pokémon have access to it. The best moveset for this Dark type is Feint Attack & Foul Play which both take bonus from STAB. Our Dark Pussycat has several weaknesses and strengths that are boosted in varied weather conditions. The chart below will help you visualize what weather is beneficial or harmful for battling or raiding with an Alolan Persian. Shiny Alolan Persian is not yet with us, we can only speculate that they will be added to the Gift Baskets in due course. Persian/Meowth is the only Pokémon to learn the move Pay Day, with Liepard/Purrloin having access to the move through Breeding. Pay Day: Numerous coins are hurled at the target to inflict damage. Money is earned after the battle. Its been long hoped that if this were to be introduced into Pokemon GO, it would allow an additional method to obtain Pokecoin. Persian is known as the “Classy Cat Pokémon”. The Pokédex in Sun/Moon & Ultra Sun/Moon has this to say about the regional variant. The post Alolan Persian: moves, meta, stats appeared first on Pokemon GO Hub.